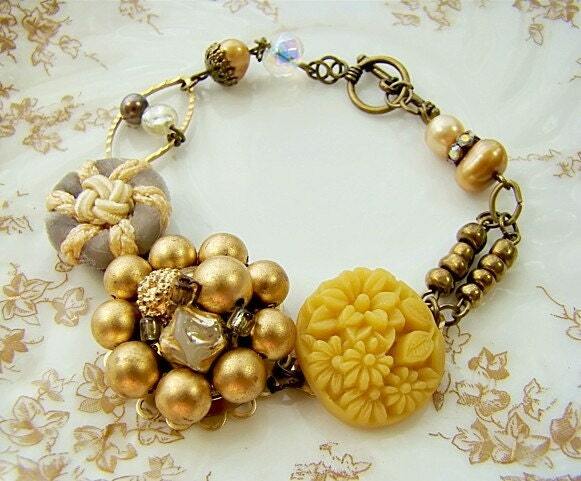 Antique inspired assemblage bracelet crafted with a vintage in matte gold and bronze hues. This one of a kind bracelet features matte gold cluster earring, a golden rod hued flower cabochon, glass bronze beads, gold freshwater pearls, old rhinestones, ivory round and baroque pearls, crystal beads and a velvet button. Bracelet measures 7 1/2" with antique brass toggle clasp closure.